With the rise of the digital age, our cherished photos of days gone by have made their way out of our photo albums and onto our social media feeds. While social media has made sharing special moments easier than ever, there is still something to be said for the comfort of having a tangible representation of our favourite memories. Rather than scrolling through your digital photo albums when feeling nostalgic, why not turn those moments into something beautiful to inspire you every day? Here’s an easy weekend project to turn those moments into a work of art with a step-by-step guide for an Instax mini wall mural. To create the wallpaper effect, you will be creating one 420 x 297 mm containing 18 Instax mini photos, with three rows of six photos each. Scan these photos onto your computer and lay them out on an 420 x 297 mm document. You will use multiple copies of this page to create a wallpaper effect. 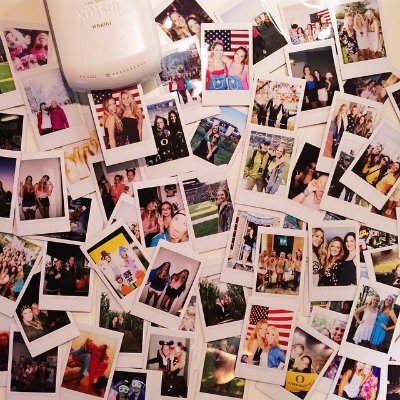 If you have a large stash of Instax photos that you wish to display, you may create multiple 420 x 297 mm images to use on your wall and space out the repeating images. If you only have a few, you can use your favourites to create one 420 x 297 mm page. 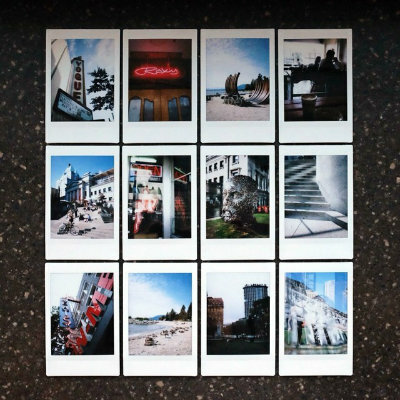 If you tire of seeing multiples of the same image, you can simply tape your new Instax mini photos over the repeating images over time. Now that you have your images selected and your 420 x 297 mm inch photo laid out, it’s time to measure the area you wish to cover with your cherished memories. With this project, you can choose to cover an entire wall or just a small area. Just measure the area you wish to cover in inches and divide by the dimensions of your 420 x 297 mm inch image. For example, if the area you want to cover is 1x1.5 m, you’ll need four copies of your 420 x 297 mm photo. Once you know how many copies of your image you’ll need to wallpaper an area of your home, the next stop is the print shop. Don’t worry about breaking your budget, as most printers will only charge about one or two dollars per copy. You’ll want these images printed on a sturdy stock paper, so choose either 120 gsm or 150 gsm card stock depending on your budget for this project. You can also choose to have your photos printed with a glossy finish for a more realistic look. If you don’t want to put holes in your wall, your best bet would be to use strong, double-sided tape to put up your images. Start from the bottom of the area you wish to cover and work your way up to ensure that all of your images are properly aligned. If you find double-sided tape isn’t strong enough to hold up your photo collage, you may also use white thumbtacks or wall staples to make sure your images stay in place. Lastly, stand back, admire your work and wait for the compliments to start rolling in. Don’t be surprised when your friends start asking for your assistance in creating their own Instax mural masterpiece. Let your personality shine! Check out the Instax Mini 8, available in colours for every style.